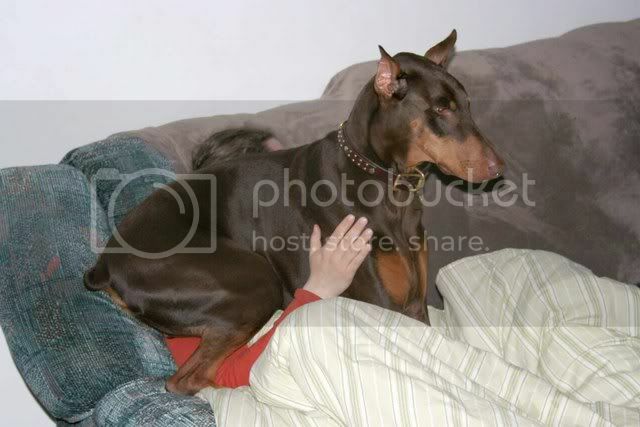 Fun > Pet comics, humor, poetry > Doberman Pinschers ~ FIVE Colors To Choose From! 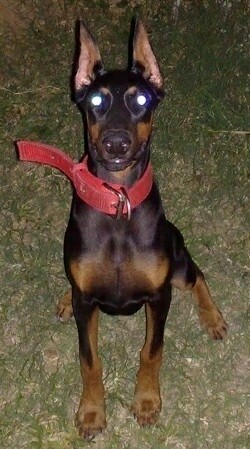 Doberman Pinschers ~ FIVE Colors To Choose From! 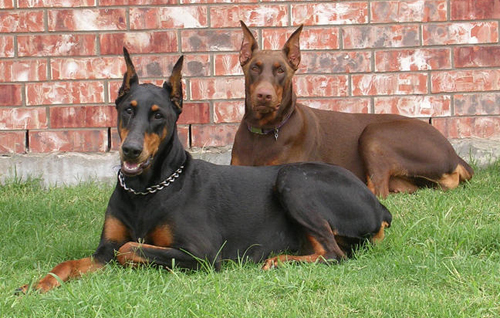 Most people think of 2 colors of dog when they hear the name Doberman. 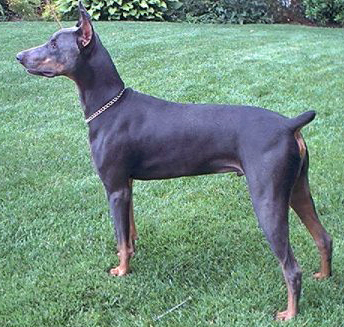 The traditional colors of the Doberman are black and tan color, sometimes called black and rust. 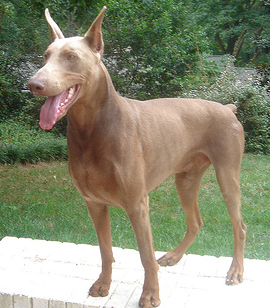 While this is the most common coloring, dobes are also seen in 3 other allowed colors which are red, fawn, and blue. 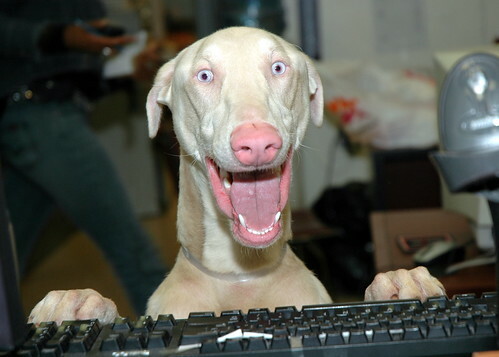 Another color that exists in Dobermans is the white or light colored cream dog. 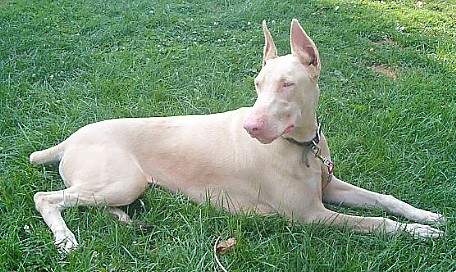 This color type was created from inbreeding and are considered partial albino dobermans; they do not have pink eyes, but rather the most beautiful pale blue eyes. 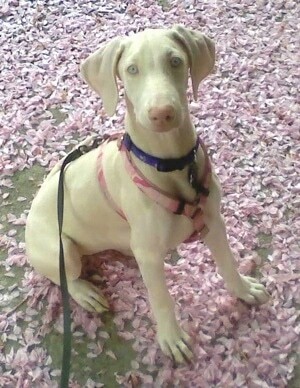 The white Doberman does look unique and interesting but again care should be taken that breeders avoid introducing these dogs into their bloodlines due to health and behavioral issues. DO DO DO DODODODODO You Are Now Under My Control. The Dog Treats are under the sink. Go Get them . . . .
went up into the tree! You threw it! ^..^ wuf! 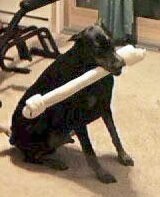 Now This is what I call a bone!!! YESSS! There's no where I'd rather sit than right on my mom! ACK! Where'd you come from??? Honest! I was not ordering treats and balls . . . . . . ummm, but if they show up I get to keep them right???? 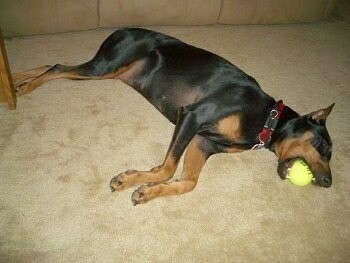 Hope you enjoyed this look at the Doberman Pinscher ~ In ALL their colors! 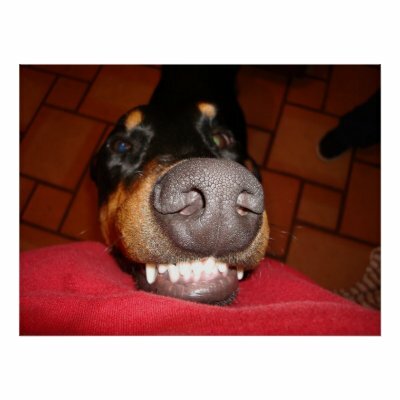 Why Your Dog Should Bite You!